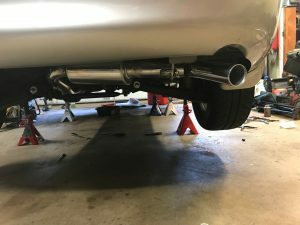 New Clutch and New Exhaust! At last couple autocross events, my co-drivers told me that my clutch seems to be wearing out, and also my garage happened to be available for me to use (my garage has been my friend’s workshop for last couple months…), I decided to tackle the big job! I debated between Mazda Value clutch kit and full OEM clutch/pressure plate/bearings, but after considering the price, and use of my car (autocross), I decided to go with regular OEM parts. If it were for my watermelon (mainly daily drive) I’d go with value kit for its price. After all, it is the kit that used by most dealerships when they change clutch for miata. Also while my car’s up and transmission is out, I changed rear main seal and front and rear transmission seal, as well as clutch master, slave cylinders. 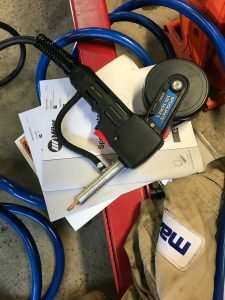 First, and important one is take pictures of how clutch line, electric line and any other component you disconnect or unplug. It took me forever plus a friends help to get the things routed and bolted right after transmission is mounted. Another thing is to have two 12-1.5 bolts cut off. In that way you can screw in the headless bolt to the engine block and use it as a guide to mount transmission. Another thing I did was changing my exhaust. 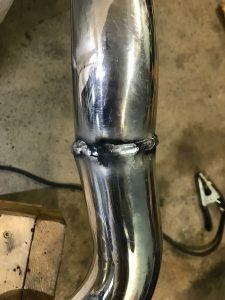 My original exhaust was in pretty bad shape, so was due for replacement. I decided (after a strong push from my friend) to try aluminum cat back. Of course there’s no off-shelf aluminum one, so I needed to build my own. 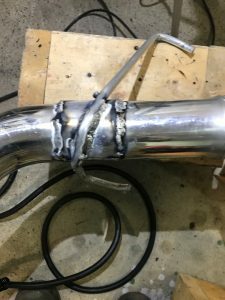 I’m just a beginner welder, so please excuse my ugly weld. It doesn’t leak (much), and seem it’s holding up fairly strong. 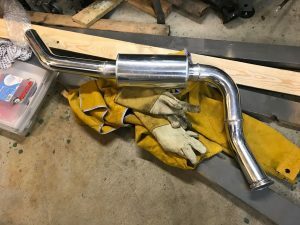 First, I cut off the stock mid pipe after resonator. 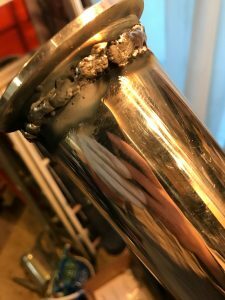 With SCCA ES regulation, I could cut out the resonator as well, but I didn’t want it to be too loud, and I’m pretty happy with the result with resonator. 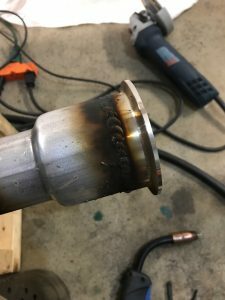 I bought 2″ to 2.5″ reducer (Like this, but probably cheaper at autozone for not so fancy regular steel one…), and welded on a steel v-band flange. 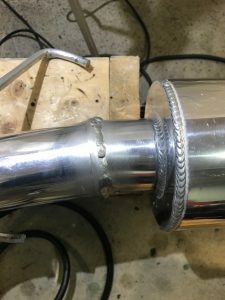 As I progress, I think I got a little better at welding, but it is still so hard, if you do just a little wrong, it gets very ugly pretty quick… and also I burned the tip a couple times…. For the hunger, I picked up a aluminum rod and used vice and a brute force to bend in to the shape. (The truth is that aluminum rod I’d quite soft so it’s pretty easy to bend in to the shape…). Also I cut out a left over piping in half, and attached to the piping. In this way, stress from the hanger will be held by two layer of piping and spread across larger area. The pipe section I cut out plus the stock muffler weigh 25.6LB total, and the new pipe welded in is only 6LB!! The question is how well it will hold up, but I will be reporting it at somepoint in the future… Also I will post a sound clip sometime soon!